Start with the column on the extreme right. Compare the mortality rates in whites to Asians and Hispanics. The lower the number the lower the mortality rate. Note that Asian mortality is almost half that of whites and that of Hispanics 75% of whites. 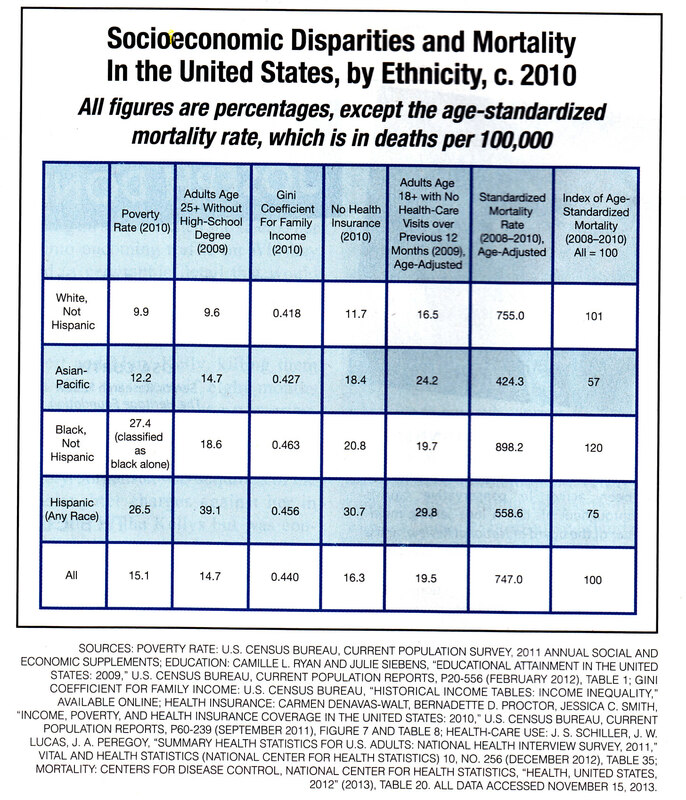 Only blacks had a higher mortality than whites. These differences are not explained by poverty, education, income, the presence of health insurance, or geography. Compared to the rest of the developed world Hispanic Americans have a longer life expectancy. Asian Americans live, on average, five years longer than Japanese. The combined mortality of these two groups is the lowest in the world even though they are economically worse off than than the average American. See Eberstadt’s Race, Class, Health. An explanation for these surprising findings is not in sight. A diligent search for it seems in order. I fail to see why an explanation should be found. It would imply that we need equal opportunity mortality. To me it will be interesting to know what the reason(s) may be if not related or explained by poverty, education, income, the presence of health insurance, or geography. The list for speculation is long and may never be accurately known. By the way, one important aspect that Northamerican medical research/studies fail and persist to insist is to categorize hispanics as a homogenous genetic entity. An Argentinian of german descent is by definition a hispanic as a Mexican of amerindian descent or a cuban of african ancestry, but of different genetic composition and environmental predisposition to disease, making in most of the times their research useless, as their initial understanding of this basic analysis is precarious.